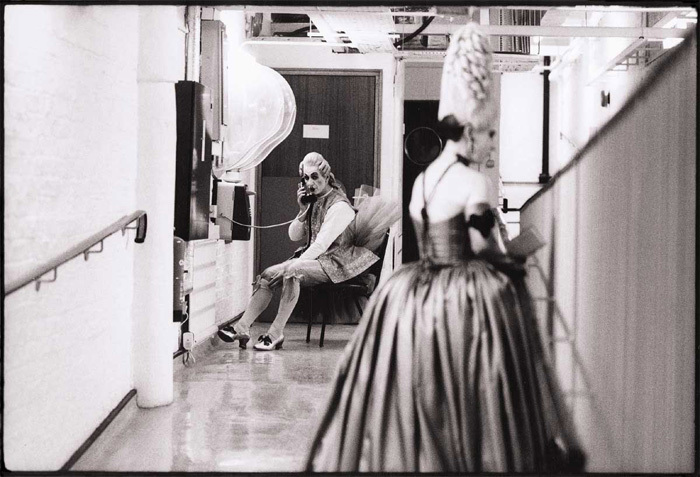 Backstage, Royal Opera House. Photo © David Secombe 1994. The House was, in many ways, the definitive “fly-on the wall” television documentary series. The six episodes, shot in 1993 and 1994, went behind the scenes at the Royal Opera House, Covent Garden to reveal the astonishing dedication, talent and sheer hard work put in by singers, dancers, technicians and craftspeople in decaying and unhelpful surroundings. It also revealed the equally astonishing conflicts, confusions and ineptitudes of some members of the management and some grandees on the Boards. The television audience, and newspapers all over the world, were gripped by the saga from week to week. Some people took it as an allegory of the state of the nation. And after it was over, the series went on to win all the prizes. BAFTA, Banff Festival, Broadcasting Press Guild, International Emmy, Royal Philharmonic Society – The House cleaned up all the statuettes. Just one puzzle remained. Despite the many awards, despite the publicity and controversy, the series was never shown again. In a culture of endless repeats of mediocre television programmes, such restraint by BBC Controllers was curious.